It can be a difficult time for many teens. But high school for Barbara Behlmann has been exhilarating. 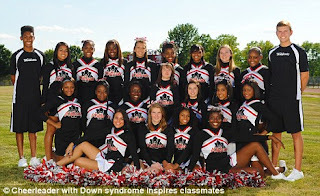 The 19-year-old has inspired her classmates at Hazelwood West High in St Louis - not because she was crowned homecoming queen or is a star cheerleader - but because she has Down's Syndrome. One of her teachers, Jodi Schutzenhofer, explained to STLToday.com: 'Unknowingly, Barbara has taught us all that nothing is impossible if you are willing to work for what you want. 'As the website reports, Barbara was four-years-old when child welfare workers placed her in the foster home of Gary and Karen Behlmann - malnourished at 22lbs. But the Behlmanns, STL Today reports, said slowly with nurturing and intense speech and language therapy, she began to flourish. Today, she is considered one of the most outgoing students at Hazelwood - and one of the most popular.